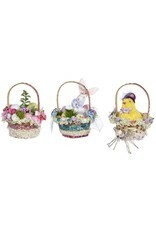 Set of 3 Easter Baskets with Easter Eggs, Easter Bunny, and Easter Chic. Size: 7 inches each. By Mark Roberts Limited Edition Easter - Spring Collection. Easter Gifts Decorations and Decor. Found, Available and in stock now at the Interior Digs N Gifts Shop Online or In store for local pick up.